The Uruguayan midfielder’s signing for Mumbai City hasn’t gone well with his former club boss. Mumbai City failed to reach playoffs last season and will be looking to repeat their show of ISL-3 where they finished at the top of the league table. Mumbai City FC has signed Uruguayan attacking midfielder Matias Mirabaje for the Indian Super League’s fifth season. Matias who played for Delhi Dynamos last season was incidentally red carded in his last game at the Mumbai Football Arena here on December 29. 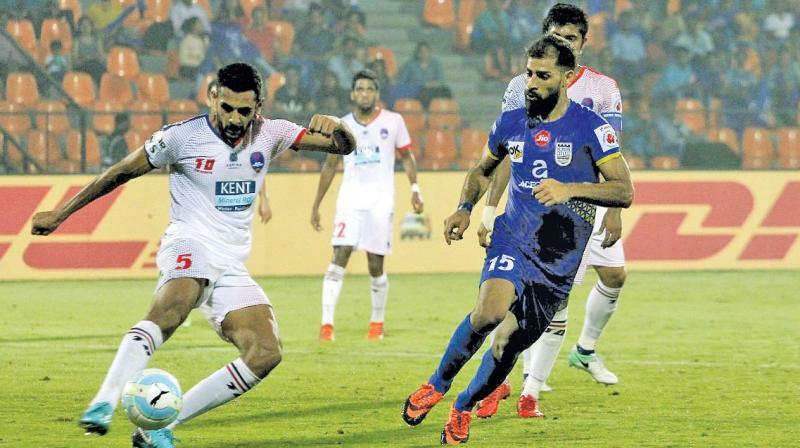 An innocuous coming together between Matias and Mumbai City defender Sehnaj Singh saw both players lashing out at each other. Tempers flared up and the referee had no choice but to dismiss both players from the playing field late in the first half reducing both sides to ten men in the second half. Mumbai City won that game eventually 4-0. Matias who represented Uruguay at the FIFA U-20 World Cup was banned for four matches and Indian International Sehnaj was handed two-match ban after the incident. Both were imposed fines as well by the All India Football Federation Disciplinary Committee. But both will be playing for the same team this season at the Mumbai Football Arena. They have buried the hatchet and Sehnaj welcomed Mirabaje to his club as a true professional. “Guess what #Islanders, someone who ‘packs a real punch’ has just joined the MumbaiCityFC family!” Sehnaj reacted. The signing didn’t seem to go well with Delhi Dynamos Director Rohan Sharma who while responding on Twitter took a dig at signing of Matias and Mumbai City’s new coach Jorge Costa. The city franchise co-owned by Bollywood actor Ranbir Kapoor had signed the former Portugese International recently replacing Alexandre Guimareas as head coach after a stint of two years. “Good luck with a midfielder who was out of shape for 75% of the season and with a coach that we immediately rejected,” Sharma wrote on his twitter page. The 29-year-old Mirabaje made 12 appearances for the Dynamos last season in the ISL, contributing three goals.